Hello dear neighbors, how are you ? A chilly eastern wind is blowing directly from Russia over here. Time to stay inside and to warm up the kitchen as well as our bellies with a nice oven-baked stew! This recipe calls for a veal cut that I am not sure how to name – short loin maybe ? I have also made it with veal chunks; as the stew cooks very slowly, tenderizing the meat, you don’t have to get expensive cuts. I threw in yellow and orange carrots from a local producer as well as some of our garden peas and homemade tomato sauce, both frozen last year. Our freezer is gradually being depleted, so when I run out of sauce I get it from the store, reading the label every time : I don’t want any sugar (which includes any -ose name) or citric acid. UnfortunateIy, I also have to make sure there isn’t too much onion either. A note for all my dear neighbors who cannot have tomato because of nightshade intolerance : I have sometimes replaced tomato sauce with cooked squash in order to adapt summer recipes to a colder season, like when making taco filling. Maybe it would be a good option here too. NOTE : You will also need a dutch oven. 1. Put peas to cook in 500 ml / 2 cups boiling water – we use mineral spring water – for about 10 minutes. When they taste tender, remove with a slotted spoon, reserving cooking water. 2. Dice celery stalks thinly. Wash, scrub, and dice carrots. 3. Heat olive oil in dutch oven on stove top and quickly brown meat on all sides. 4. 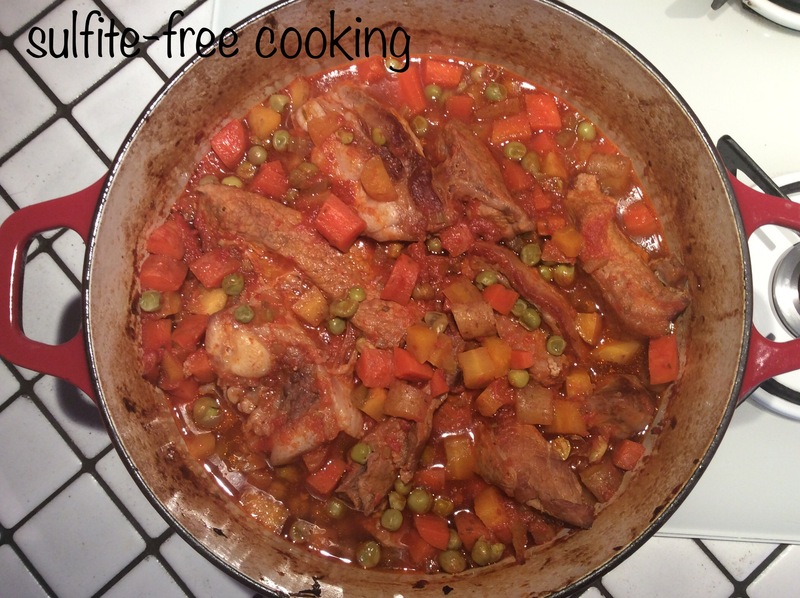 Add cooked peas + 400 ml / 1 ½ cup cooking water, carrots, celery, tomato sauce, salt and pepper, if desired. Don’t strain your eyes trying to find the celery, dear neighbor: as it gets diced first, it is hidden under the carrots! Some lousy photographer took this fuzzy photo… but you can spot the celery now, can’t you? 5. Cover and place in oven to bake for 1 hour and 30 minutes. The celery will « melt » and the sauce will thicken slightly. So good ! Enjoy! I hope you are keeping warm, dear neighbors! It looks perfect for this cold snap. You know, I’ve just realised that I’ve never seen veal for sale anywhere near me. I can’t help but feel I’m missing out. I’ll buy some veal seeds and grow my own, that’ll teach them! For some recipes strawberry can also work in place of tomatoes, the bitterer the better. That’s too bad. Well, you could probably make this stew with some beef instead. Do you have a dutch oven? Totally worth the expense: this is the best way I have found to make tough meat edible. Somehow I don’t have as much luck if I just leave the pot over a low flame. Please let me know if you find veal seeds, or lamb seeds for that matter: our kids could definitely use some! When we visit them in the U.S. I am saddened by the lack of variety in the meat section of food stores. Born of the fact I had very hard bitter strawberries and was curious.